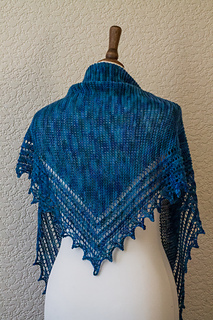 A sideways shawl designed with hand-dyed variegated sock yarn in mind – a mixture of stockinette, garter stitch and clean lace lines breaks up the colours and helps to minimise pooling. 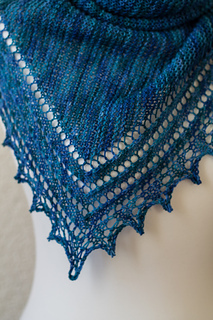 The pretty pointed lace edging is worked at the same time as the main body of the shawl, and the sideways construction allows you to use up as much of your yarn as you like. 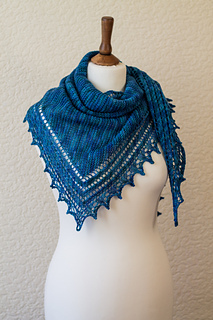 This would be a great pattern for beginner lace knitters to try - the lace pattern is straightforward and easy to follow, and the sideways construction means that there are no long/boring/difficult cast-ons or bind-offs! The pattern is both fully charted and fully written out row-by-row. Basic lace knitting, including yo, ssk, k2tog, etc.